I don’t know about you but I don’t ever tire of fruit deserts; especially this time of year when the fruit is at it’s peak. I stumbled upon this recipe last year and I’m glad I did. My recipe list of fruit deserts keeps growing and that makes me very happy. You can’t see it in the photo but there is a yummy cream cheese mixture under all those gorgeous berries. Next time you have a cookout be sure to include this on your menu. You won’t regret it! Preheat oven to 400 degrees. Line a sheet pan with parchment paper, and place the pie crust on the parchment paper. In a bowl combine the strawberries, blueberries and sugar and stir to combine. In another bowl combine the cream cheese, flour and sugar until smooth. Add in the vanilla extract and stir to combine. Spread an even layer of the cream cheese mixture on the pie crust, leaving an inch border all the way around. Place the berry mixture so that they cover all of the cream cheese mixture. Fold the edges over about every inch to inch and a half and continue all the way around. Bake for 20-25 minutes or until the crust is a light golden brown. Let cool on a cooling rack completely and serve at room temperature or slightly warm. I will start out my new blog with a recipe of those yummy strawberries you see on my home page. 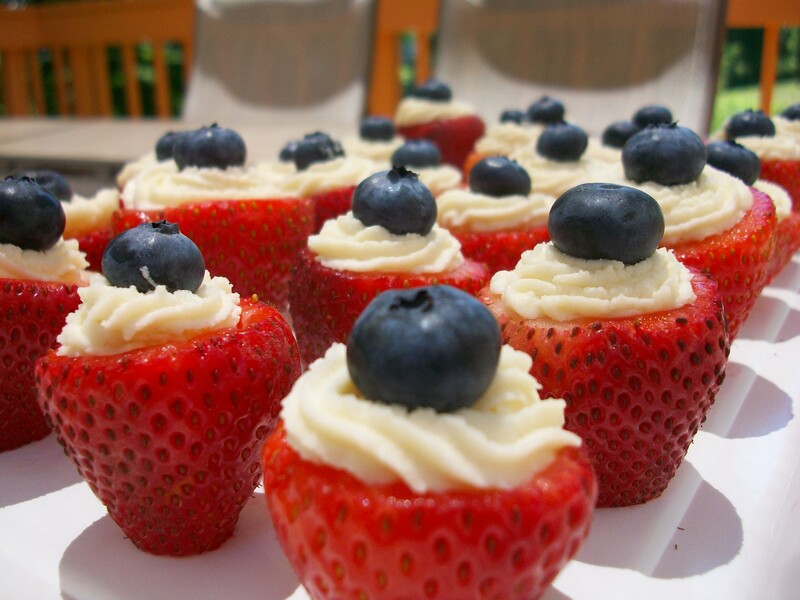 I made these for the 4th of July, but they can made anytime. I had originally planned for the strawberries to be part of the desserts; others had their own opinion. They quickly became part of the appetizers. Cut the tops and bottoms off the strawberries. With the small end of a melon baller scoop out the inside of the strawberries. Beat the mascarpone cheese, powdered sugar and vanilla till smooth and slightly fluffy. When the cheese mixture is done, put into a pastry bag (or Ziploc bag with a corner cut) and pipe into the strawberries. I used a #32 tip. Top each strawberry with a blueberry and enjoy. You can make these ahead of time and keep them in the refrigerator till ready.